Sensei 1.9 is currently in the beta testing phase, and one of the new features included with it will be downloadable language packs. Sensei in your language at the click of a button! We rely on the Sensei community to contribute translations. Sensei is currently being translated into 30 languages, but there are only 8 languages with over 80% of the strings translated. We are looking for bilingual/multilingual Sensei users who can help us translate Sensei into other languages. If you know a language other than English, you can help. All you need to do is head over to our Sensei project on Transifex, and click HELP TRANSLATE “Sensei”. You’ll be taken to a signup page where you can create a free account, and as soon as that’s done you can start translating into any of the listed languages. If your language isn’t listed, you’ll need to request a new language, and once we’ve approved the new language you can start translating. I already translated Sensei. How can I contribute my translation? If you’ve translated Sensei into your language, using POedit, Codestyling Localization, Loco Translate, or any other translation plugin, you can easily upload your .po file to Transifex. Just join the translation team for your chosen language and click on “Upload file”. How do I use Transifex? Translating in Transifex is simple, you just select an English string on the left, enter your translation on the right and click “Save”. If you need more help using Transifex, check out their support pages. If you have any questions about contributing translations, leave a comment below. Our company also has an LMS plugin (learning management system). 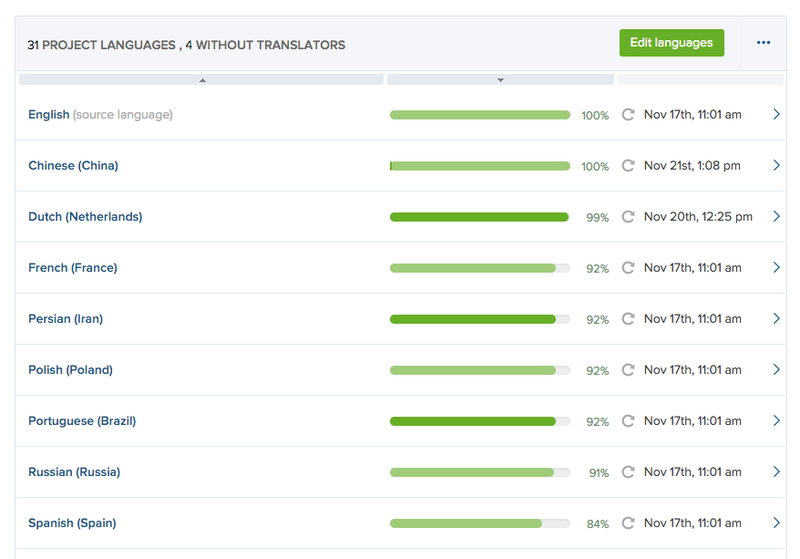 We’ve now opened up the floor for everyone to help translate this plugin into other languages than English and I happy to announce that Dutch is one of the languages that’s almost at 100%. If you’d like to see Sensei in your native language: follow the links and help us translate!